The first article in my series about the magazines I’ve been reading. I don’t have any remembrance of where or when I got this but I found it really interesting. It’s what it says on the outside. It’s a catalogue of their publications over a 25 year period. As with every catalogue it has all the useful information. 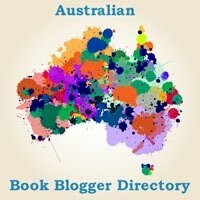 The name of the publication, name of authors or editors, a description of the work and then some extracts from reviews. I’ve not sat down and read this many book descriptions in one go before, it was fun. 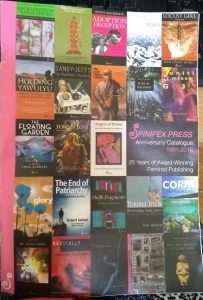 Spinifex Press focus on feminist and literary publishing. I wanted to make it through to the end of this catalogue without marking a single book to put on my To Be Read Pile. I didn’t succeed. In order to remember these books I’m going to write them here. The reason is because want to give the magazine to a friend, she doesn’t know it yet but will this week. Haifa Fragments: A Novel by Khulud Khamis – about intertwined cultures and relationships. Surviving Peace: A Political Memoir by Olivera Simić – how do you pick up the pieces of your life after fleeing your country due to war? I don’t know if there’s a theme or thread here, but they all looked really interesting.